Many homeowners are under the assumption trying to sell their homes during the winter is a bad idea. However, the numbers show otherwise. The housing market doesn’t dip in winter months as much as people think, and plenty of buyers are still out looking for the right deal. There’s no need for homeowners to wait until spring to put their houses up for sale or pull their properties from the market starting in November. 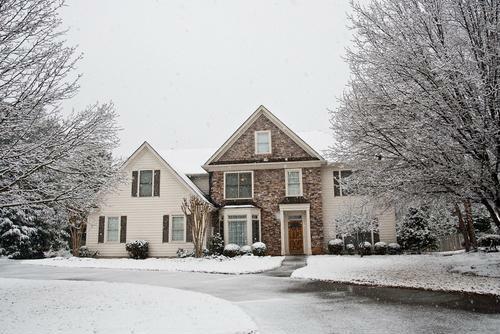 According to data released by Redfin last December, homes put on the market during winter months between March 2011 and March 2013 were more likely to sell by 9 percentage points compared to homes listed during warm months. Not only were they more likely to sell overall, but the homes listed December through March sold faster and for more money compared to homes listed during other months. On average, 56 percent of homes entering the market during nonâ€‹-winter months sold within six months, while 65 percent of homes listed during winter sold within six months. Homeowners willing to ignore the naysayers and follow the numbers should spruce up their homes for winter to draw in potential buyers. It’s true the dark and cold could potentially put buyers off from house shopping, but the right amount of curb appeal will get them into their coats and to a seller’s door for a showing. Sellers can take advantage of the holiday cheer and winter aesthetics by adding outdoor lights and hanging wreaths on the front door – maybe even putting some flameless candles in the windows to make the inner warmth of the home seem enticing. Not only is what buyers see important, but also what they smell when entering a home. Homeowners can use pine in wreaths to evoke pleasant winter memories or bake a few sugar cookies before a showing. Additionally, sellers should make sure to always keep their walks clear of snow and ice so that buyers don’t see potential safety hazards before they get to the door. First-time home buyers shopping in winter should contact Alex Romo at the Federal Savings Bank, a veteran owned bank, to learn more about low rate mortgages and the pre-approval process. In today’s economy, we all have to be a little smarter with our money. I offer the best program Chicago has to offer! 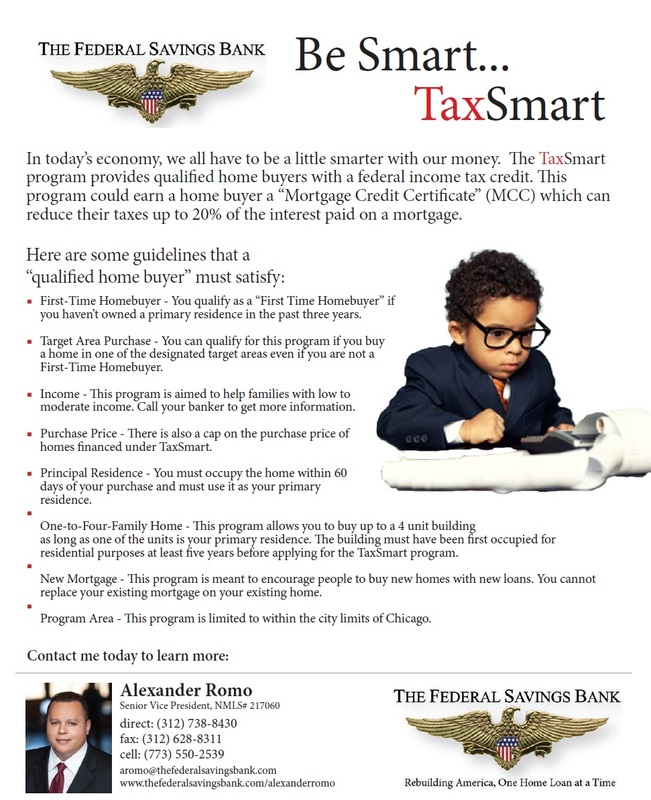 The TaxSmart program provides qualified home buyers with a federal income tax credit. This program could earn a home buyer a “Mortgage Credit Certificate” (MCC) which can reduce their taxes up to 20% of the interest paid on a mortgage. Buyers can obtain an annual tax refund up to $2,000/ year throughout the life of the loan!!! !